As we celebrate Global Action Week for Education 2018, Education International calls on its affiliates and education activists to urge governments to invest in free public quality education and to recognise and support educators. 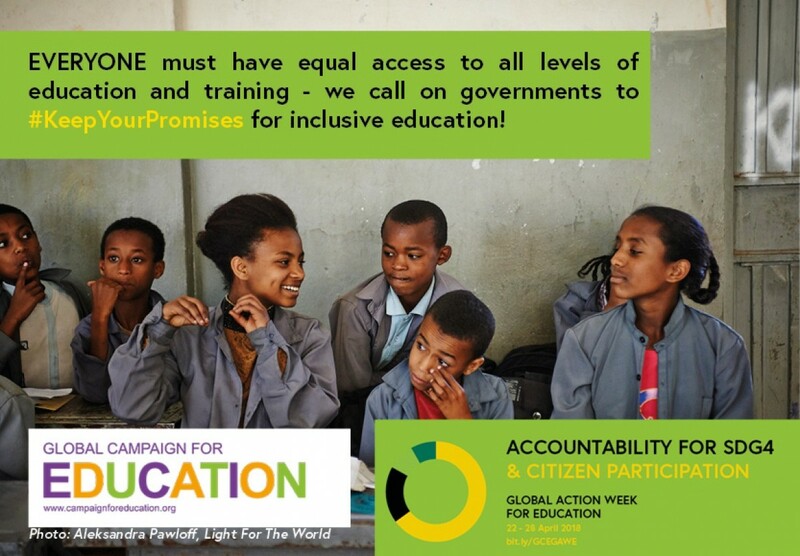 Global Action Week for Education (April 22-28) highlights the theme “Accountability for SDG4 through Citizen Participation”, with the focus of holding governments and the international community accountable for a full implementation of the Social Development Goal 4 (SDG4) asking them to "Keep your promises" to work towards financing public, equitable, inclusive and free education for all. All UN member states committed to providing free and equitable primary and secondary education and ensuring that all children have access to quality early childhood education and affordable quality technical, vocational and higher education. The governments also committed to increasing the supply of empowered, well-trained professionally qualified, motivated and supported teachers and educators. Governments must deliver on this goal, and citizens must play their part in holding them to account for it. For social media and graphic resources click here. The GAWE is one of the main activities organised by the Global Campaign for Education (GCE), a broad-based coalition uniting trade unions, nongovernmental organisations, institutions and community based organisations engaged in education. EI is a founding member of the GCE. Organised annually since 2001, its main aim is to put pressure on public authorities, policy makers, donors, and other stakeholders to ensure that the right of all children and young people to universal, free quality public education is fulfilled.